The essence of a place is intrinsically woven in its culture, art, and heritage. 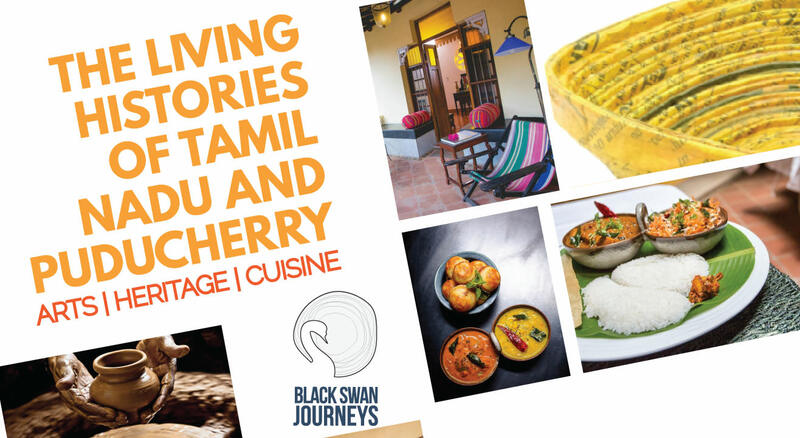 And that is precisely what Black Swan Journeys’ Tamil Nadu-Puducherry cultural trail offers, it threads in intangible subtleties and provides a new canvas of these two destinations. Our experts guide you through its rich heritage, and skilled artisans provide insights into their lives, craft, and techniques. Traveling through Tamil Nadu and Pondicherry, you will come away with a new-found appreciation for food. Link back the influences to the colonies that settled along the southern coast and appreciate the delicacies born out of a marriage of native ingredients and foreign recipes. Experiences from the way your food is made to the way their statues are cast, in the way of their forefathers, we present to you a slice of Tamil vibrance, past present and future combined! Visit Dakshina Chitra Museum - A living history museum dedicated to the art & craft of the Southern States, embark on a guided walk through the exhibits here. Hard Granite Stone mined in the Swamimalai and Kanchipuram. These are hand sculpted by artists mainly in the Dravidian style. Post demo, you will be transferred to Pondicherry. (approx. 1hr50mis). On arrival, check-in and relax. After breakfast, and drive to Auroville. Embark on a guided visit to Auroville with a resident guide to explore the beautiful surrounds and understand the way of living here. Free time for lunch on own at Auroville restaurants and then participate in a Waste Paper Craft Work Shop at Well Paper - Well paper products are hand-made and eco-friendly, transforming recycled newspaper into art and accessories. From baskets, bowls and coasters to jewellery, X' mas ornaments, and colourful Paper Mache figures. Later in the evening, take part in a demo of local Tamil delicacies at your stay. Return to the stay. After breakfast, today morning you will embark on a Heritage Guided Walk of the Old Quarter with an INTACH expert. On arrival, check-in and relax. Later enjoy guided orientation tour of the heritage Swamimalai property – the hotel emerged from the existing village framework, its heritage, culture, traditions, lifestyle, and practices. Created by local craftsmen, serviced by the neighbourhood and entertained through local talent. After an early breakfast today begin the full day Chola Bronzecraft workshop - The craft has been in existence since the Chola Empire, 12th century AD and still remains unchanged. The artists model a figure in bee wax, cover it with a special clay mixture and heat the mould. The wax drains out, molten bronze is poured into the mould and is then dried and chiseled to perfection! Return to your stay. Today, after breakfast, we leave for a visit to Thanjavur. Later you will attend a demo on Veena – A musical Instrument Making - The veena's history records back to the Vedic times. Identified with goddess Saraswati, the veena also finds mention in the Ramayana and the Mahabharata. It is often called the Hans (Swan) Veena. And is it unique to Thanjavur because the instrument is made from a particular strain of matured jackfruit tree found only in that area. Post the demo you will start for Kadiapatti. On arrival here check in and relax. Later drive onwards to Madurai (2hrs). On arrival in Madurai, enjoy lunch (on own). Later embark on a Guided visit to Meenakshi Amman Temple – This 6th century BC temple is dedicated to Parvati, known as Meenakshi, and her consort, Shiva, here named Sundareswarar. It houses 14 gopurams (gateway towers), ranging from 45–50m in height. The tallest is the southern tower, 51.9 metres. After breakfast, check out and you will be transferred to the airport for your departure flight. Two way airport transfers as per recommended flight timings only.